The Bastioni and Sommergibile lines that run parallel to each other under the collapsed Morandi bridge, are scheduled to reopen on Thursday, 4 October 2018. The restoration involves four tracks for the northbound movement of goods from the port of Genoa and passengers to Acqui/Ovada and Busalla/Arquata via Sampierdarena/Rivarolo. This reinstates railway traffic to the level before the collapse of the Morandi bridge, with some minor changes to the timetables to be determined by RFI in the next few days, as the tracks of the Succursale line are still blocked by debris. The working group Train Performance Management prepares a monthly report about punctuality development on the corridor. The August figures are available on the Customer Information Platform. Please click here. If you need more information about punctuality on RFC Rhine-Alpine, please contact the EEIG office. The overview on major works and temporary capacity restrictions for timetable 2019 and 2020 has been updated and is now available in CIP for your Information. If you are interested in participating, please contact the EEIG office, and you will receive a direct link to the survey questionnaire via email in September. 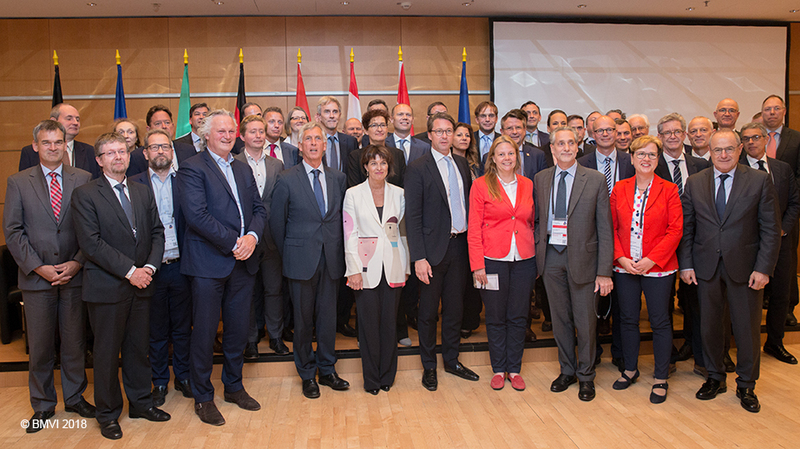 In the frame of the International Tansport Forum (ITF) on 23 May 2018 in Leipzig the Transport Ministers of the countries involved in RFC Rhine-Alpine and North-Sea Mediterranean signed a Ministerial Declaration on international contingency measures. Click here for the familiy foto. Transport Ministers emphasize the importance of close collaboration between the countries and the relevant stakeholders in the event of a major incident. They support the ongoing efforts made by the infrastructure managers within the organisational framework of RFC Rhine-Alpine and North Sea-Mediterranean to improve traffic management in the event of disruption and thereby improve the reliability and availability of European rail freight corridors and ist Players. The Ministerial Declaration can be downloaded here and under downloads/European context on the corridor website.